Bridget Jones meets Burnt in this delightful comedy novel about a talented YouTuber and the guy who keeps trying to bring her down. 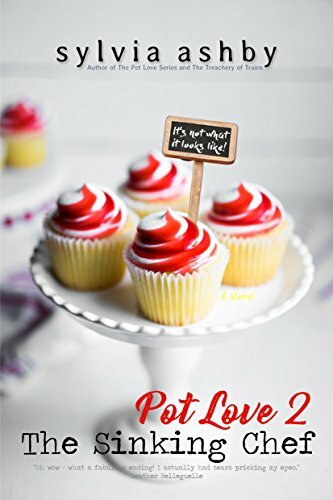 Although part of a series this book is completely standalone, as are all other novels in the Pot Love Series. Thank you to the author and publisher for the chance to read and review this book. I took part in the cover reveal for this back in June and I said then I was excited to read this. While it’s the second in the series, you can read it as a stand alone which I did. There is plenty of details to make sure you’re up to date with the previous book and that you know how the characters have got to where they are. I think the ending of this book was the best bit. Not because it was finished but you finally got to feel what Ashley feels. Her anticipation, her excitement and her worry. I felt more for her on the last few page then I did the rest of the book to be honest. Which I feel bad about. She is a good character, she’s funny, clumsy, and just a strong character in all. I never really related to any of the characters. I think that, for me, I should have read the first book. Some of the characters didn’t really add anything to it for me, they were just background noise. The writing style was quick and easy to read. It moved along nicely without any need for pointless paragraphs or speech. One thing I didn’t like was the timeline. It was never really made clear that weeks were passing at a time. There was also a few discrepancies, like Ashley giving a vase to someone and then the next she still had it. I tried to look over it but it happened more than once and I had to check details more than once. The storyline in general was a little farfetched but it was enjoyable. It was the ridiculousness of it that made me keep reading, I wanted to know what outrageous thing happened next. And I also wanted to know who it was happening to. Everything about this book kept me entertained, I just wish that I had read the beginning of the series. Currently, she lives in Leuven, Belgium with her husband, daughter, son and a sparrow called Jack, who comes occasionally to peck the seeds she leaves for him on top of the garden shed.